Was at Paul McCartney's wedding today! At the registry office at least! He got married at the Old Marylebone Registry Office on Marylebone Road. Great atmosphere. Saw him go in and come out. When he came out the traffic ground to a halt and all the car drivers were tooting their horns. Macca was loving it! Also saw Ringo Star going in. I was reasonably close but only had my phone with me, so the pictures were crap. Attended the Stop The War demo in Trafalgar Square today, marking the tenth anniversary of Britain and the US attacking and occupying Afghanistan. It was a good event, good turnout. A lot of high-profile speakers, including Tony Benn, George Galloway and Jemima Khan. 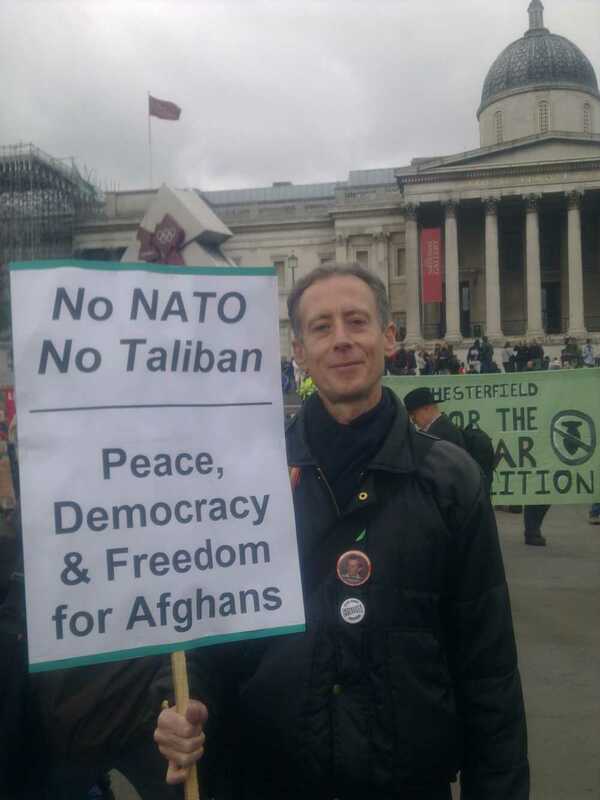 Great to see Peter Tatchell there too. Said hello to him and asked him to pose for a picture, which he was happy to do. We then marched to Downing Street and blocked the road completely for the best part of an hour. The police squeezed us to open up a lane to traffic but there was one lane closed for the duration of the protest there, getting on for two hours, which is something of a result! 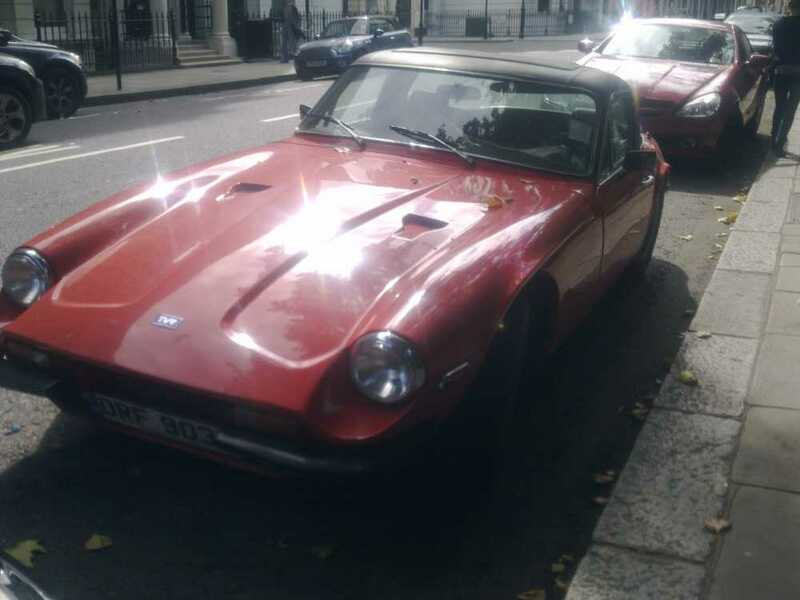 Nice TVR. Saw it near Collingham Road in Kensington. 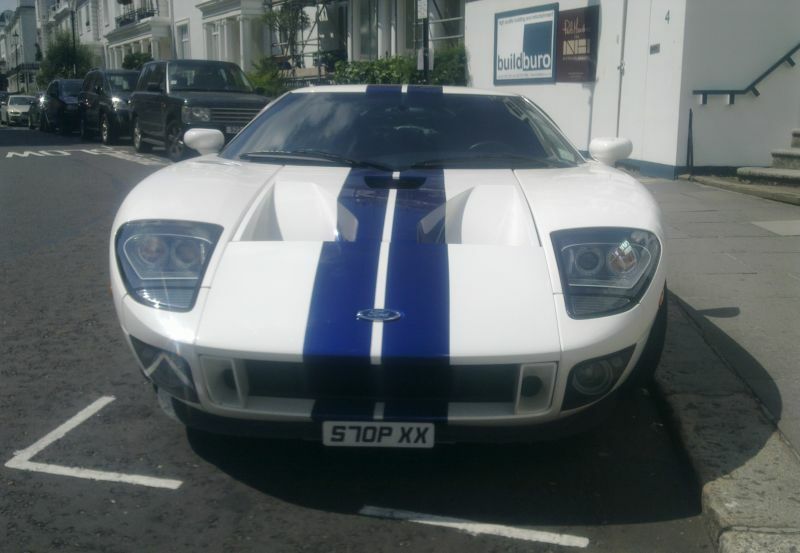 Not sure of the model (can't remember exactly). 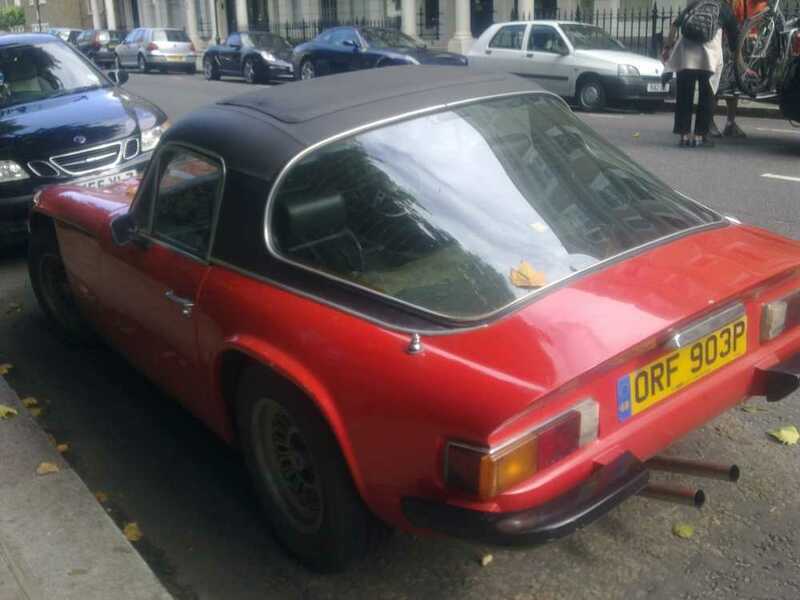 It's a 1976 model, going by the registration number. 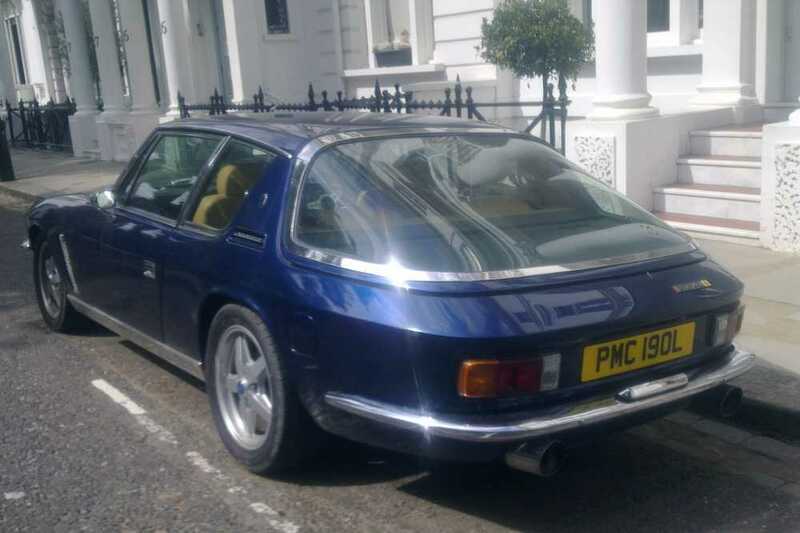 I love the big back window on these, just like a Jensen Interceptor, but I especially like the gigantic centre console and the short gear lever...really sporty cockpit! Also love how low they are. 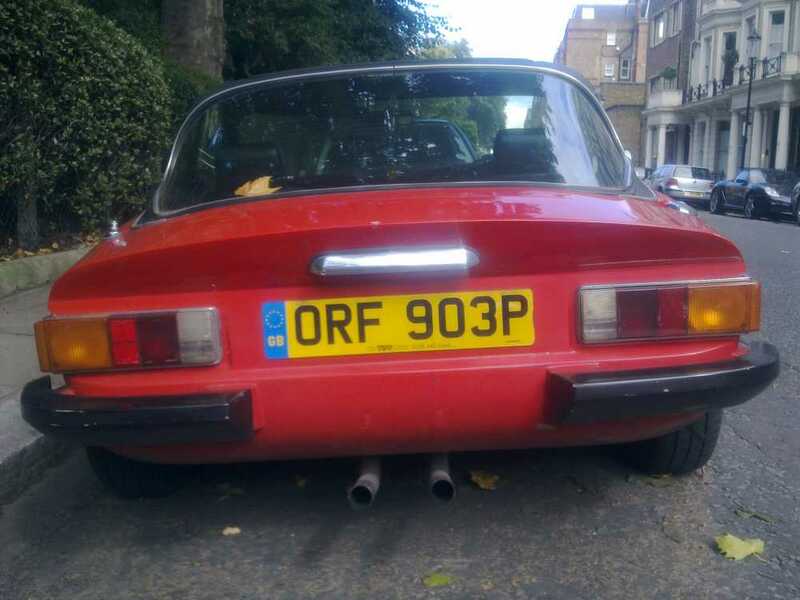 Looks like Triumph Dolomite lights on the back although I don't think they wrapped around on the dolomite. 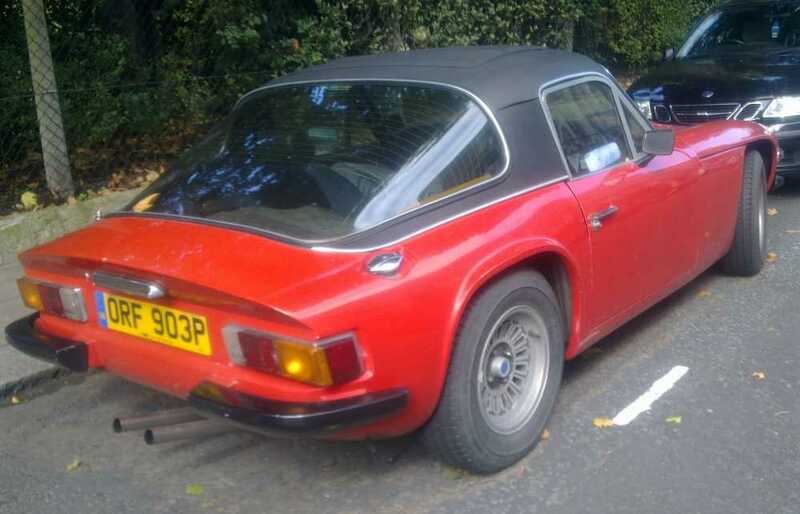 Had a think about this and checked some pictures online, pretty sure they're Triumph TR6 lights. 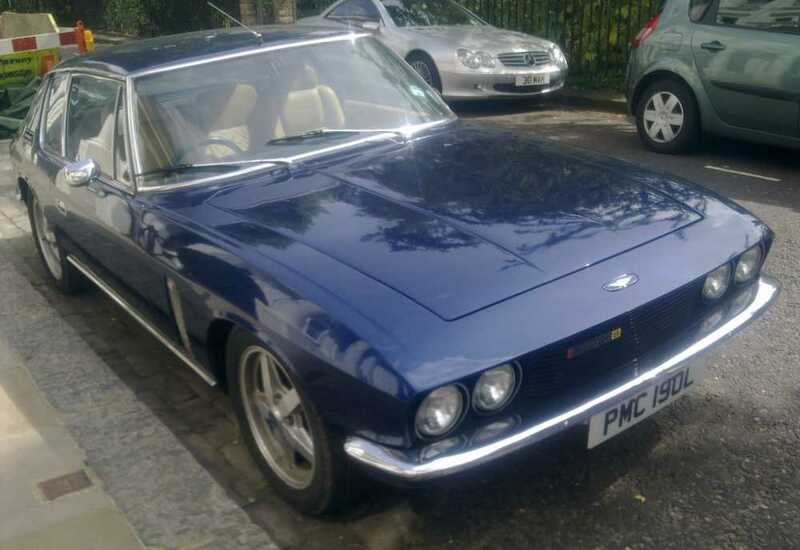 Spotted this Jensen Interceptor off Gloucester Road in Kensington. Nice. About 7.5 litre if memory serves me correctly. 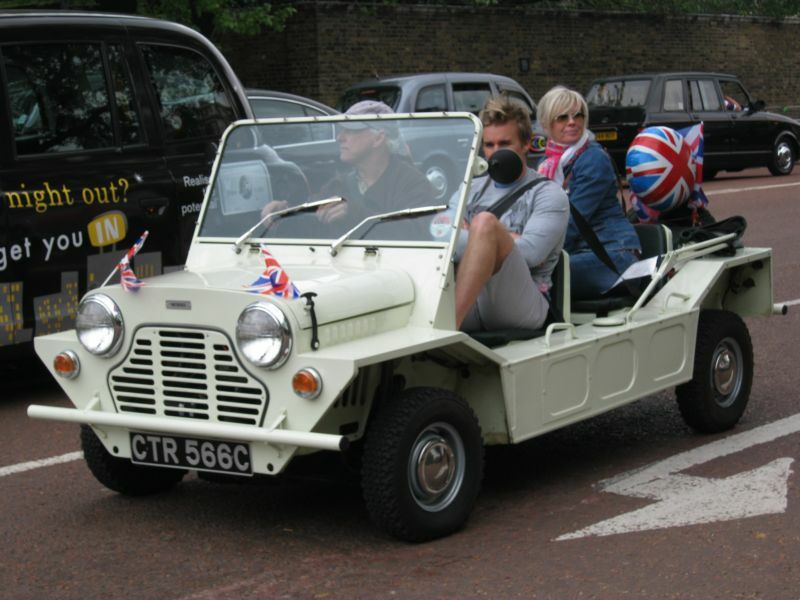 Ideal for nipping around London Town! Love the big back window on these. 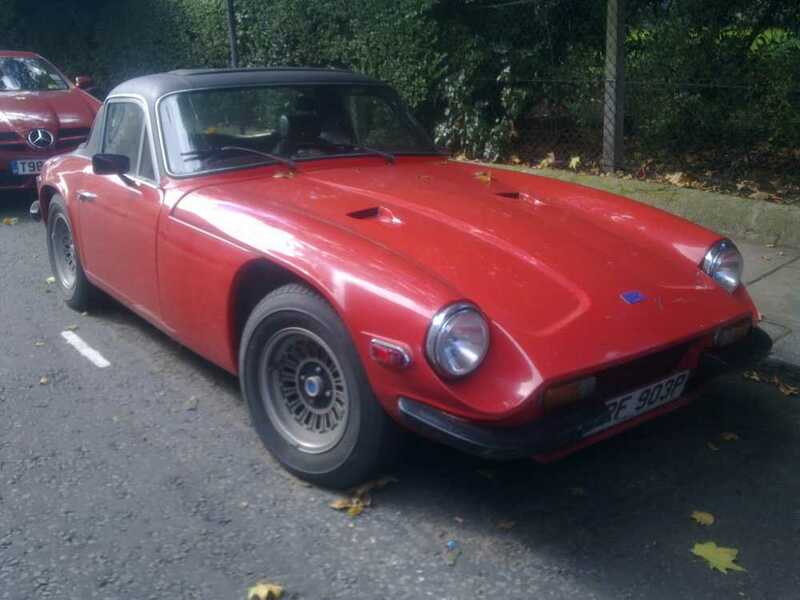 This is a 1973 model, going by the registration number. 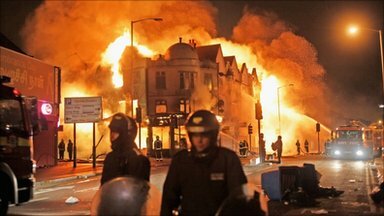 Been pockets of rioting and looting in London (and elsewhere in England). Pure wanton vandalism and theft. It was sparked off by the death of a black man in Tottenham, shot dead by the police. The following trouble is on the back of that but has nothing to do with that particular incident, there being many white people involved in the violence too, they are gratuitous "copy cat" events. Happy to say there is no trouble in South Kensington where I am. Not expecting any either. 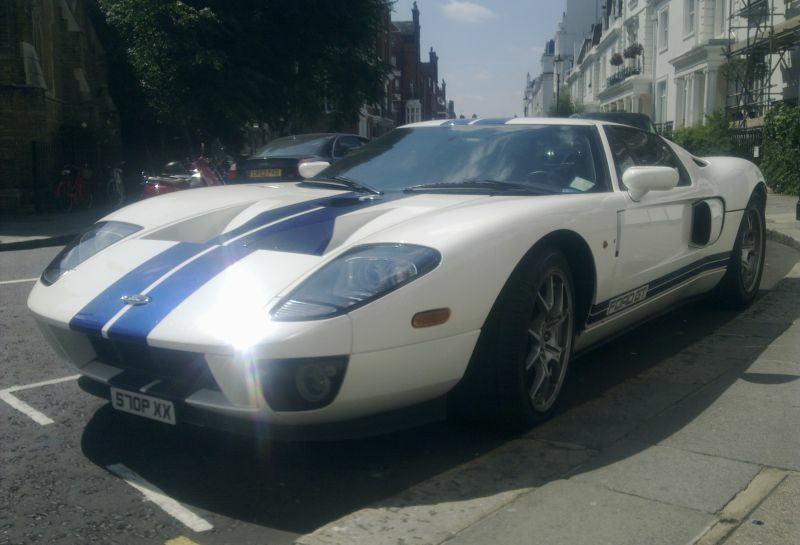 Spotted this nice Ford GT (or GT40 as they were once known) in Knightsbridge. 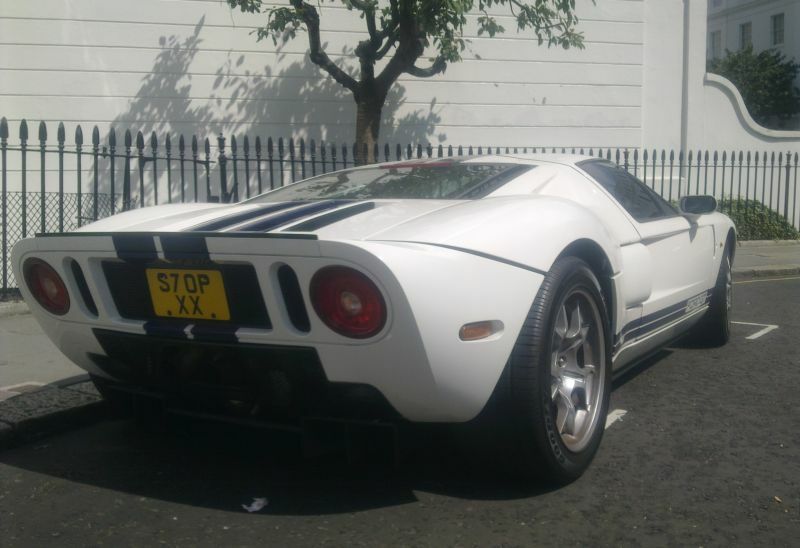 One of the best-looking cars ever made, in my opinion. Stegs reckons it could be a sign. 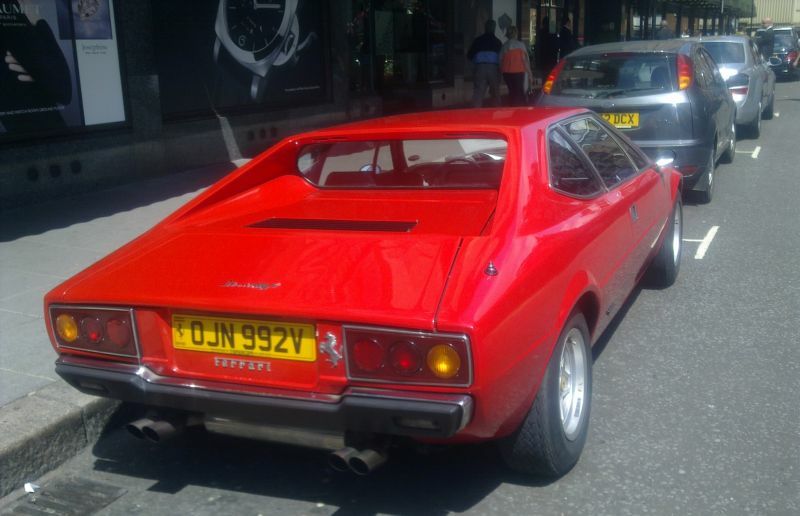 Spotted this nice Ferrari Dino parked outside Harrods. 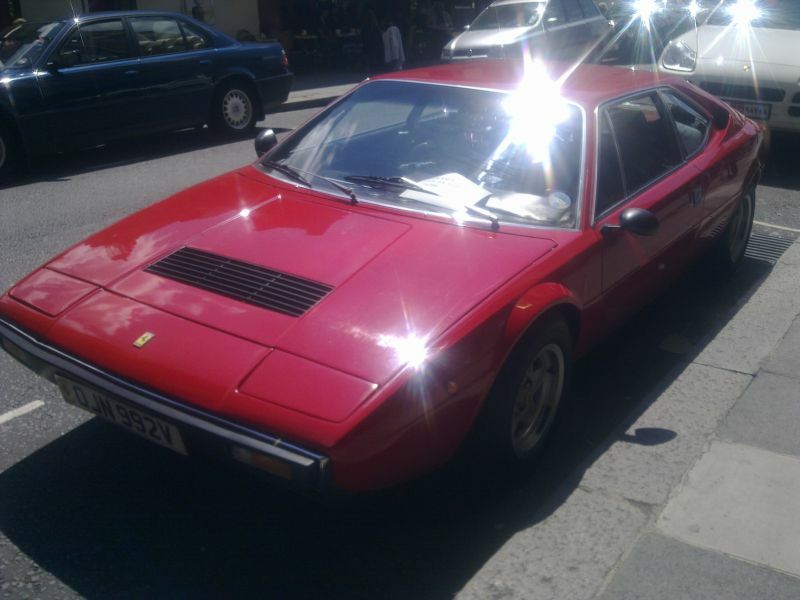 These were never badged as Ferraris, but this one like a lot of them has had a "Ferrari" badge added to it. The name "Dino" is that of Ferrari's son who died at a young age. 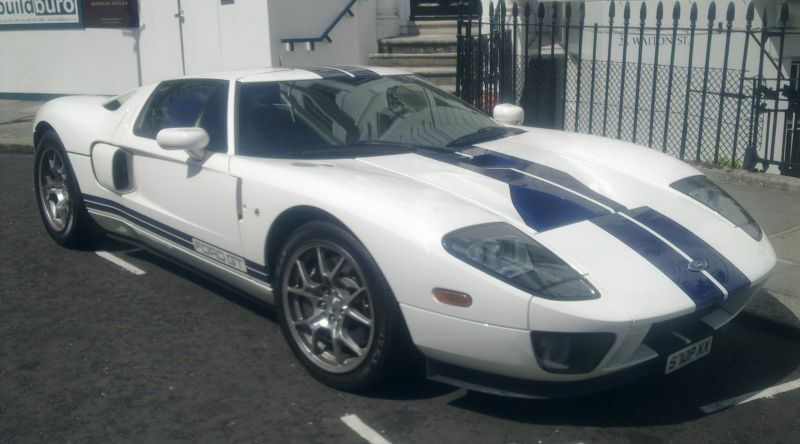 This car was a tribute to him and I think the reason why it was simply called "Dino". 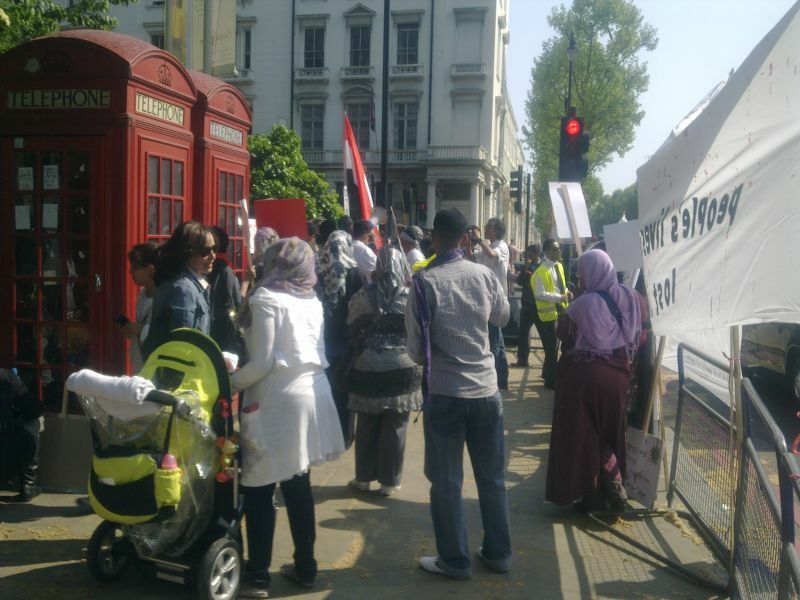 Was taking a stroll in the sunshine this afternoon when I came across a demonstration opposite the Yemen embassy on Cromwell Road, across from the Natural History Museum (there's a lot of embassies around here). Spoke to some young people there. Like other Arab states there is a revolution against dictatorial leaderships who have been in power for a long time. The main message I got today was that people were becoming poorer in the land. "We are protesting here opposite the embassy of Yemen to show support to the Yemeni revolutionists in Yemen who are protesting peacefully against the corrupted regime." "We want to topple the dictator regime in Yemen and the head of corruption Ali Saleh and his family after 33 years of their corruption and injustice." 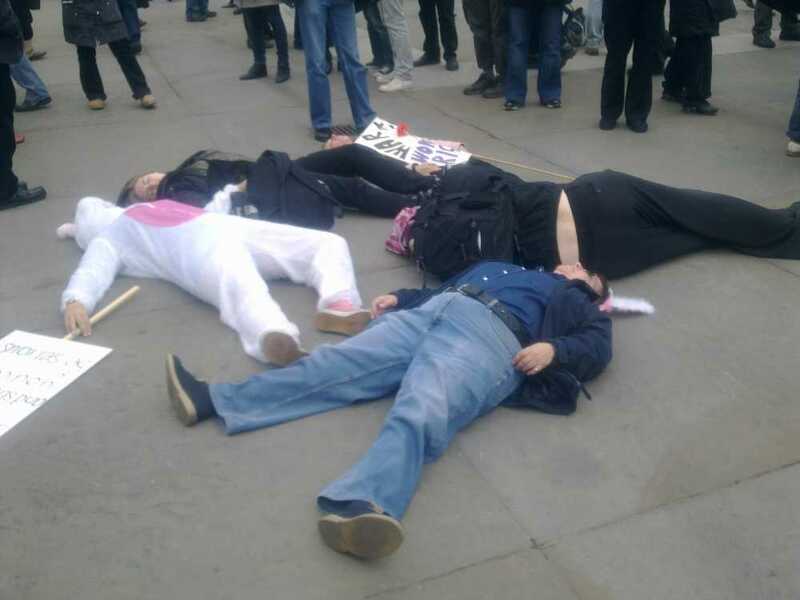 I thought it was interesting that they said they had protested outside the American embassy, looking for support. It's not every Arab cause that would ask the US for help. 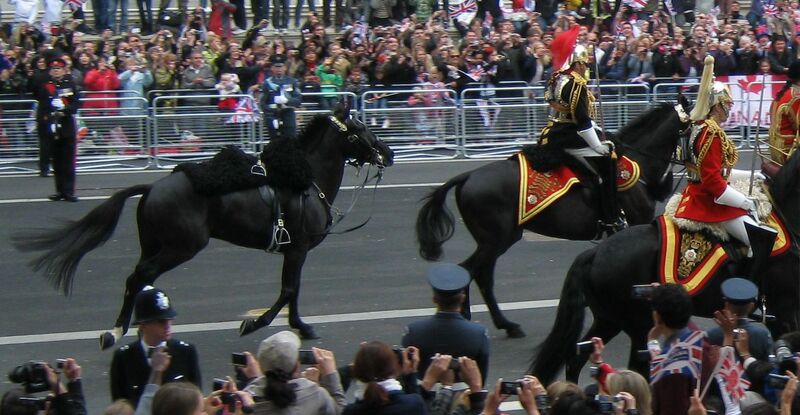 Kate and William Guard's horse missing its rider! 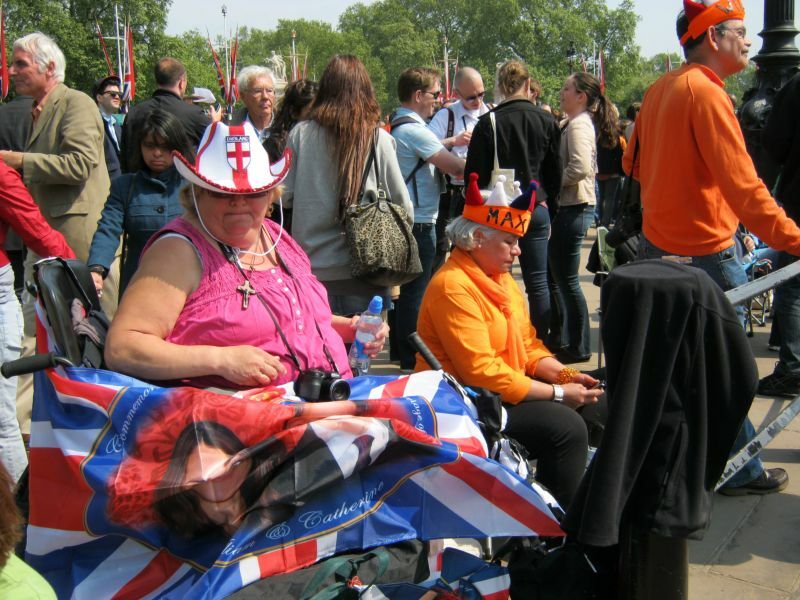 Went into town today to catch the Royal Wedding. Great day. Fantastic atmosphere! I arrived in Whitehall at 7.30 am. It was very quiet on the way in. Got the tube from South Kensington. Not many people around, two empty buses passed me, tube was quiet. Westminster tube station was pretty quiet too. Was a bit suprised when I hit Whitehall to see the number of people who had got there before me. Not mobbed but every front row space was taken. On the previous day I had only seen one group of people camping out, so expected it to be quieter. Still managed to get a pretty good spot. Was between the Cenotaph and Downing street. I was on a wall at the top of some steps. At the time of writing it's a bit late and I really can't be arsed writing much! The pictures pretty much tell the story. Being at the same spot for five hours was interesting. Got to know quite a bit about the people next to me! That was part of the atmosphere, everyone excited, enjoying themself, having a laugh. When it was all over I shook the hands of the guys I had been talking to. All good stuff. 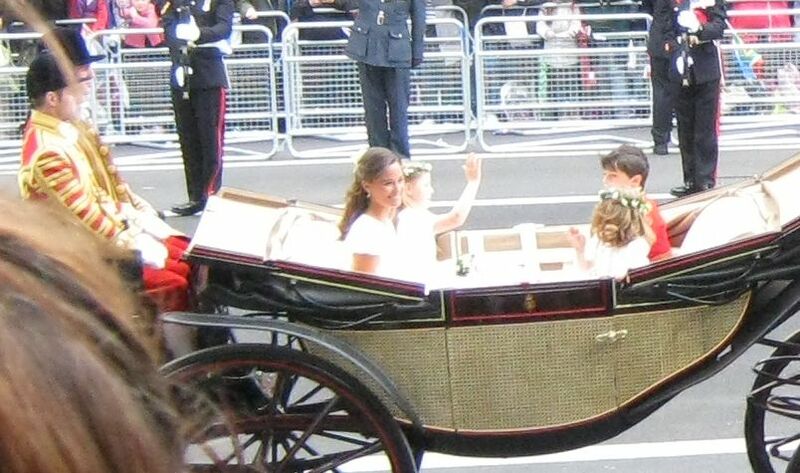 In the picture of Kate and William, you will see that she has her head bowed and William is saluting. This is because they are passing the Cenotaph which is a memorial to all those killed in the Second World War. Biggest hoot of the day was before any procession arrived but a good crowd had gathered and were cheering anything that moved. A group of about half a dozen street sweepers were walking along the route doing a final tidy before the procession. They were getting a huge cheer, applause and whistling. They were initially a bit embarrassed but then began to have some fun, waving back. It was one of those cases where the more people cheered, the more others joined in and it resulted in one of the biggest cheers of the day! Real hoot. Then a couple of guys followed behind them, carrying clipboards. They looked liked supervisors of some sort. Being the Council they were probably writing feedback on the sweeping and how close it came to target and what future improvements could be made. The cheering subsided as they passed. 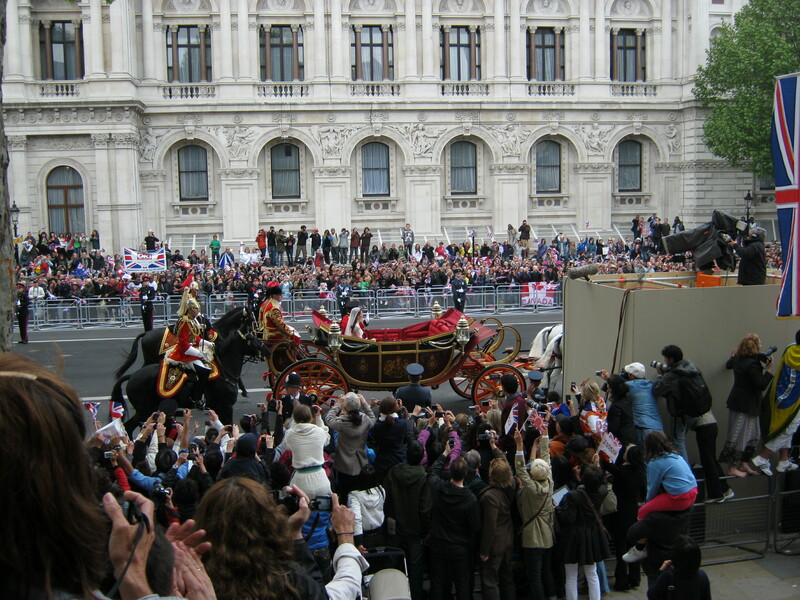 When the final procession had passed, I went over to Buckingham Palace and saw them on the balcony, albeit from a distance. I didn't watch from the Mall. As you can see from the picture, with half a million people there the view wasn't great. I went through St James's Park and came out at the side of the palace, still a bit away but I could make them out on the balcony and noticed them kissing...twice! 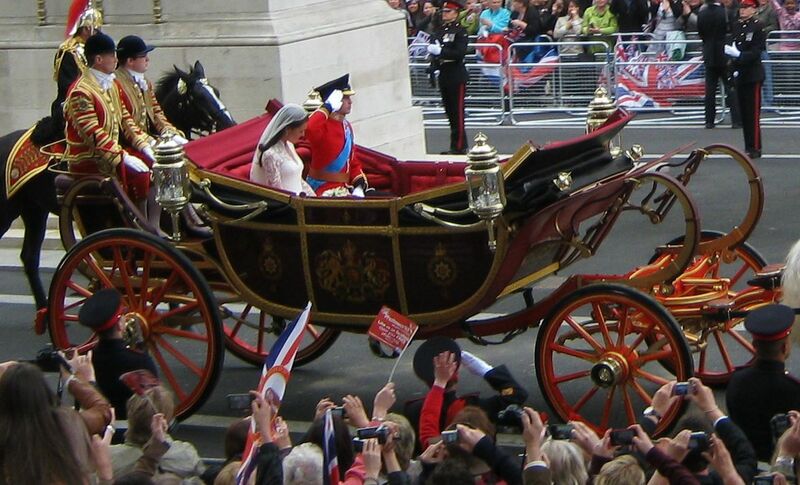 It helped that Prince William was wearing a bright red tunic and the Queen was wearing yellow...easier to spot! There was a fly-past of a Spitfire, Hurricane and Lancaster bomber. Amazing sight. Followed by modern Tornado and Typhoon jets. 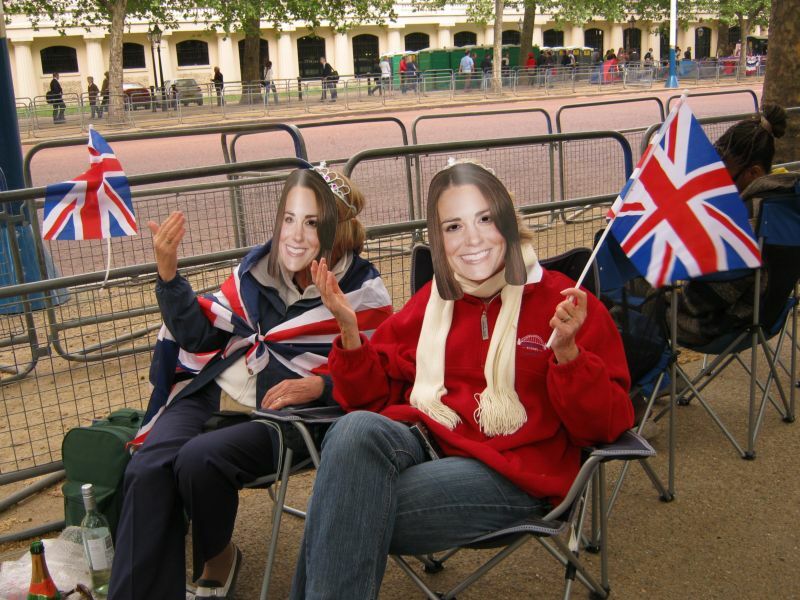 Took a walk into town today to catch the Royal Wedding vibe...wedding is tomorrow. Fantastic atmosphere about the place! Went to Buckingham Palace then walked the route of the wedding to Westminster Abbey. Absolutely crawling with media and tourists. Everyone taking pictures, myself included. Was surprised at how few people were camping out to save a good space for the day itself. I figured the whole route would be deep with people camping out. Absolutely not. 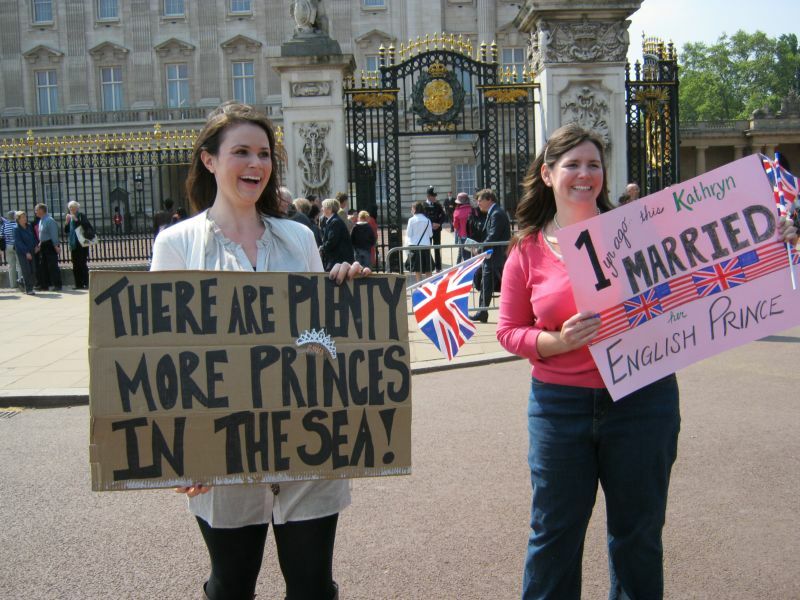 A group of people at Buckingham Palace and a group of people at Westminster Abbey. That was it. There was one party on Whitehall, from Wales. Spoke to them, good laugh...banter etc. 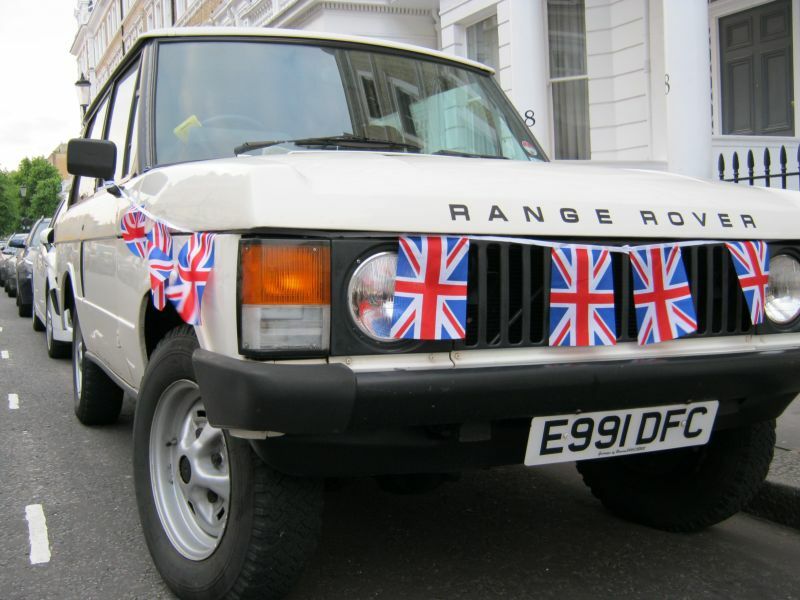 I drove the route later in my old Range Rover with some bunting on her...getting in the mood! There were more campers down the Mall but still acres of available space for anyone wishing to claim a spot. I'm going in to see the wedding tomorrow. Despite the abundance of space today, I think I should get myself in early tomorrow!